Bravely Default was one of the most notable releases for the Nintendo 3DS back in 2014 and for a time, it was well received. But public perception on the game changed after players started hitting the forty hour mark, when they started playing the latter half the game’s storyline. I’ve been replaying this game in preparation for it’s sequel, so I wanted to go back to this and reassess how bad this really is. At this point, I will be talking about SPOILERS so if you have yet to beat the game, I suggest that you turn back. The four main protagonists of Bravely Default are on a quest to awaken the four Crystals of Luxendarc: the Crystals of Wind, Water, Fire, and Earth. The game’s Prologue chapter provides the set up for this, with the next four chapters devoted to the party’s efforts to awaken each of the Crystals. After awakening the four Crystals, something happens and each of the next four Chapters follows the protagonists as they reawaken the Crystals four more times. No, that’s not one Chapter for each reawakening – you need to reawaken all four Crystals in Chapter Five, and again in Chapter Six, and again in Seven, and once again in Eight. This repetitive cycle has caused people to accuse Square Enix of artificially padding the game and have ruined what was once thought to be one of the best JRPGs to ever be released on the 3DS. 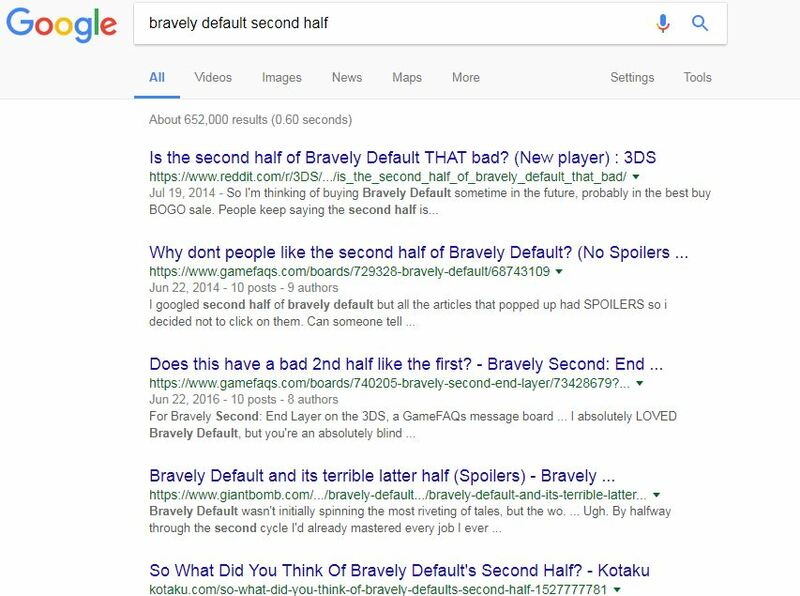 Bravely Default is known for having a “bad” second half, as this quick Google search can attest. In order to have a clear feel of what turned people off of Bravely Default, I’ve listed the notable events and details of each chapter. Couldn’t have this game been trimmed down? Did we really need four more chapters of awakening the same four crystals? 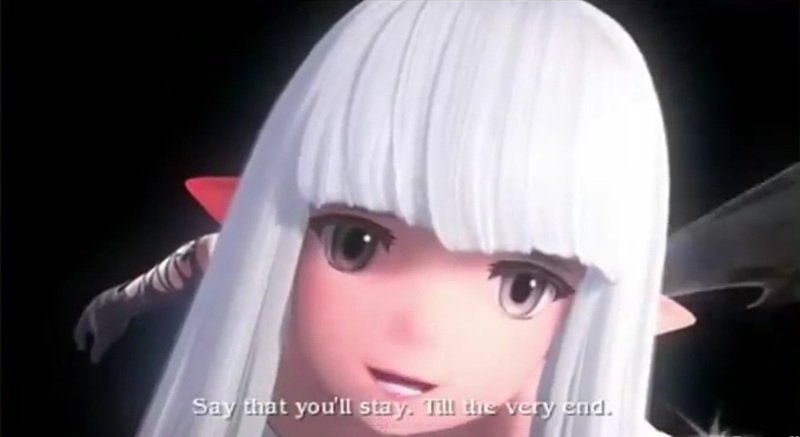 Before we go to the chapter specfics, let me establish a few things: (1) Bravely Default allows for players to reduce or even turn random encounters off, (2) you can change the difficulty settings at any time, (3) there’s an Auto battle feature that players can use and finally, (3) the subquests are completely optional. With all that said, let’s look at each succeeding chapter in detail. From a narrative perspective, Chapter Five is supposed to confuse the player. Did the adventuring party simply go back in time? You get clues every now and then that this isn’t the case – you’ve been transported to another version of Luxendarc, one that’s very similar to the world you originally came from. The main quest involves awakening all the Crystals again and fighting the same bosses. After reawakening the second Crystal, the party is forced to meet up with the Sage Yulyana who then insists on meeting Agnes and one other (of her choosing) in private. Agnes chooses Tiz, but nothing really explicit is discussed. 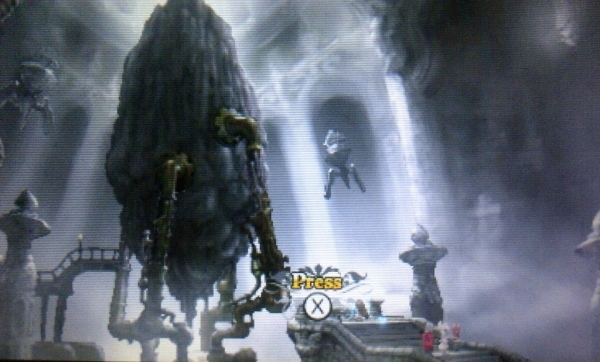 The party also faces Alternis Dim back at the Pillar of Light as they did in the previous world, but this fight has great revelations: this marks the first time when a character explicitly labels Airy as the enemy, and Ringabel’s memories start to come back in the next chapter after this encounter. Most of the subquests – the asterisk bosses – are there to showcase the subtle differences between this and the Luxendarc that you came from. To be honest, this world isn’t that much different from the previous world. I get that this chapter serves to prolong the mystery of what really happened unsolved for as long as possible, but at Level 99 with the game set at Easy difficulty, it still took me around five hours to get through all of the asterisk bosses. And everything plays out almost exactly the same way, making the chapter feel repetitive. In terms of gameplay, I found these to be entertaining rematches as both sides have powered up – the bosses have boosted health and stats, and you have the benefit of the additional Jobs that you’ve picked up along the way. But to someone who’s playing Bravely Default for it’s storyline, I have to admit that the plot starts to stall in this chapter. At first glance, this world seems to be much more different than the two worlds prior. In this Luxendarc, three of our heroes/heroines are already dead – it was Til who survived the destruction of Norende, and both Agnes and Edea have already perished. These differences don’t really get touched on until later in the chapter (more on this later). The main quests still involve reawakening all the Crystals and fighting the same bosses, but this time around Ringabel starts questioning their purpose. He also asks Tiz to propose meeting with Yulyana, knowing that the sage will ask for a more private meeting with Agnes, and asks Tiz to talk to Agnes about Ringabel’s memories. Ringabel is the Alternis Dim of the world prior and he has remembered what happened – Airy manipulated his world’s versions of Tiz, Agnes and Edea and slaughtered them after they had done her bidding. Most of the asterisk boss fights play out in the same way, save for a few that Yulyana uses to tempt our heroes to abandon their quest and live out normal lives in this world. This, combined with Ringabel’s clarifications, test’s the player and implicitly asks the question “Are you going to keep following this fairy who is clearly lying or are you going to stop?” but the game doesn’t really clue the player in on what choice is right. Despite the similarity in most of the asterisk boss fights, the events of the main quest has to happen in this exact sequence in order for it to make sense so my take is we really needed to have both a Chapter Five and a Chapter Six. Anyone playing Bravely Default should get used to this sequence. In this chapter, the optional asterisk boss fights are much more interesting as they don’t play out as expected. First of all, they start teaming up with each other and some of these team ups are quite unexpected. The scenarios leading into the boss fights are either hilarious sequences played up for comic relief, or are character-building moments that shed more light into their motivations. It’s a pity that in the same chapter where the optional boss fights have become more interesting, that’s when the main narrative dies completely. By this time, the protagonists have already decided to push on with their quest. The story no longer throws any curveballs at them to make them once again question their purpose, and it is only up to the player’s patience as to whether he/she would continue awakening the crystals or follow the hints given in Chapter Six and just break one of the crystals. Skipping the optional quests would mean that this chapter provides nothing for the player, besides the same exact four boss fights prior to each crystal awakening. Sadly, Chapter Eight is similar to Chapter Seven – interesting asterisk boss fights that don’t really push the narrative forward, and the same old boss battles in the main quest. The optional asterisk boss fights are quite a treat from a gameplay perspective – they really squeeze the most out of Bravely Default’s battle system (especially on higher difficulties). Once you’ve reawakened the final set of crystals, the story finally moves forward and you enter the climax of the game. I hate to admit this, but the latter half of Bravely Default really does feel repetitive, even if you factor all the game features that would ease up the gameplay. The optional boss fights in Chapters Five and Six contribute very little to the advancement of the game’s plot, and the story stops advancing completely in Chapter Seven and Eight. A big part of enjoying an RPG is the overall story and the pacing issues of Bravely Default can definitely have a negative impact on the experience despite offering great gameplay experiences (the asterisk boss fights near the end are awesome). See your quest through, no matter what. Stay, till the very end. The repetitiveness is part of the game – you need to earn the good ending. Have you played Bravely Default? What did you think about the game’s final four chapters? Let us know by leaving a comment or two below!